You’re almost there! You’ve just set up your sales funnel to turn cold traffic into real buying customers. But, there’s one final step we want to cover so we can get the most out of our funnel. Note: If you haven’t set up your funnel yet, be sure to check out our previous steps and start growing your business in no time! Get started here! We took a look at the 3 ways to grow a business in our previous posts. We detailed how to increase the number of customers in our post How To Write Engaging Content and Master the Blog Post. Note: For more on ways to increase traffic, we have awesome resources for you to check out. Each of these help to make sure you’re writing valuable blog posts, but also successfully grabbing attention. Check them out! We also covered how to increase the average transaction value per customer by using Tripwire offers, upsell offers, and profit maximizing offers. These are the first two ways to grow a business. A lot of business owners focus so much on attracting new customers, they forget to market to what may be their best source of new sales… their existing customers. We’ve discussed how to turn traffic into customers though our previous steps, however, we now want to turn existing customers into return customers who buy frequently again and again. That’s where the “Return Path” comes in. This final step of our sales funnel is all about increasing the frequency of purchases from our existing customer base. We can do this by using strategic email marketing efforts to direct our existing audience to additional lead magnets, tripwires, upsell offers and profit maximizing offers. 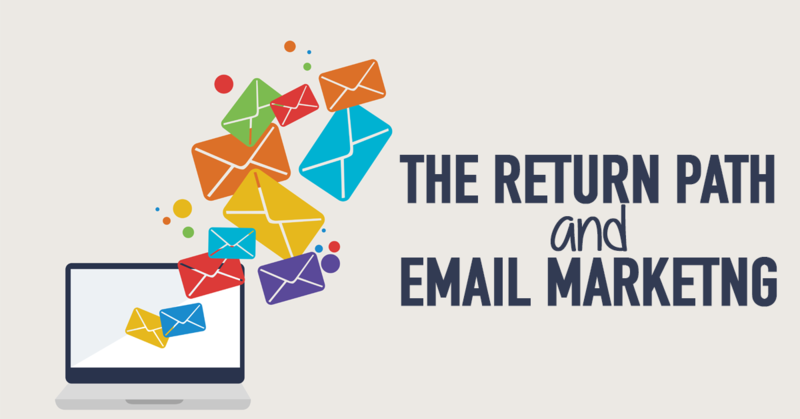 One of the most common ways to direct traffic toward a return path is to use email marketing. This is an incredibly effective strategy as it’s even more direct than advertising. We can continue to send offers to our existing customers as they’ve already opted-into receiving emails. They have already been “warmed up” to our brand, our business, and our products. They’ve been presented a free high-value offer and may have even taken a significant step to purchase our tripwire offer. These existing customers are now our most qualified leads. They’ve already bought from us and are far more likely to buy from us again as compared to any new customers who have never bought from us before. In addition to email marketing, another great strategy is to run advertisements through banner re-targeting, social media, search engines, and more. 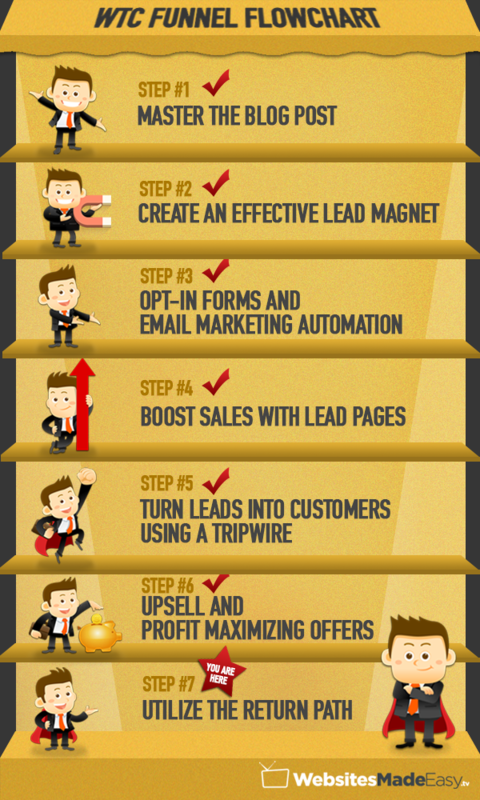 All of these efforts combined can really boost your inbound traffic toward key points in your sales funnel. Tip: You can also send traffic toward your funnel organically by using strategically placed links in your other blog posts. To learn more about this, check out our article on repurposing old content, here! Here’s the really cool thing about the return path: It can be used for two main reasons.. 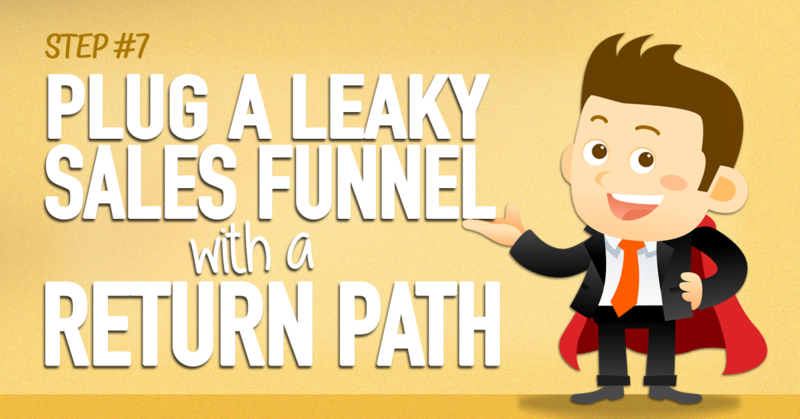 The return path enables the traffic that has gone all the way through your funnel to continue toward other offers. This same traffic that has already opted-into your offer and even purchased your tripwire can be directed toward other sales pages and new funnels. By using email marketing and return path strategies, you’ll be able to sell to this segment again and again. Another purpose for the return path is to direct certain segments of your audience back to specific areas of your funnel where they may have dropped off. You’ll find that at certain points along your funnel, there will be a percentage of the audience that drops off. With the help of your email marketing tool, you’ll be able to identify who has not completed a certain checkpoint along the way. These segments can be remarketed to in order to encourage them to take action and move to the next level. Similarly, you could try sending certain segments different offers in order to see if they would make the jump to the next level. You could try sending a new lead magnet offer, a new tripwire offer, or core product with different upsell and profit maximizing offers instead. This may take some testing, but it’s well worth it since these are now your qualified leads. You’ve successfully set up your first sales funnel! You’ve truly come a long way and should start to see fantastic results. However, there are always improvements and little tweaks that can be made with each step of the sales funnel. Whether it’s trying to switch up your lead magnet offer or even your email subject lines, small changes can go a long way to make your funnel as rewarding as possible. Let us know what you loved about this series and what has worked for you in the comments section below! We’d love to hear about it! And if you missed any of our 7 steps, be sure to check each of them out and get started here! We have awesome video tutorials and helpful articles to get you up and running with a highly profitable website in no time. We want to help you build your website and business online, but we want you to have fun while doing so! You have got to check out the members area of our website where we have tons of goodies to help.